Hi! 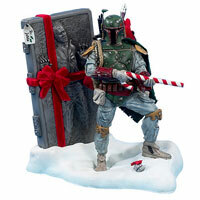 - Here is a quick update from www.bigbadtoystore.com about more exciting new preorders and a variety of new arrivals! Check out the lastest 30th Anniversary Collection update tonight, featuring a fan favorite Commander Gree, in one of the coolest of all clone decos. Too bad he didn't last long after Order 66! Brian's Toys is at Wizard World Chicago! Come check us out at booth #2248. Along with our regular Star Wars, GI Joe, and Transformers products, we will unveil a partial selection of our vintage graded Nintendo games. We will also have a couple of showcases of select Premier Collectible Auctions items on display, along with auction catalogs. Don't forget to check out the great Summer specials at www.brianstoys.com, with nearly 200 items discounted! Also, spend $85 and get your choice of free toys! More details in this week's newsletter! Super articulated Darth Vader makes his way into the '08 30th Anniversary Collection as part of the Enhanced Visual Guide weekend update. It's time to re-introduce 4 Visual Guides previouisly only available in our standard format, but now in our Enhanced Visual Guide format. We thought we'd do the entire '08 line in full Enhanced format so step back a bit and re-check out these 4 '08 TAC figures, now in hi-res over in the 30th Anniversary Visual Guide! It's time to introduce the 2008 figures to our Enhanced Visual Guides! Check out this super articulated version of Obi-Wan Kenobi from the '08 30th Anniversary Collection. Want details on some of the major exclusives planned for Celebration Japan. Click here to check out what you can expect to be hunting for in a few weeks, including an ultra-limited Classics Bust! Brian's Toys Red-Hot Summer Specials! Break out the shades and the sunscreen! Brian's Toys is having a scorching Summer sale, slashing the prices on nearly 200 items! With great deals from lines like Star Wars, Indiana Jones, and G.I. Joe just for starters, you owe it to yourself to take a few minutes and jump on over to www.brianstoys.com to check out these Summer specials! Just browse your favorite product line and let the prices do the talking! With red-hot deals on items by Hasbro, Gentle Giant, Kotobukiya, Master Replicas, and the list goes on..., you may want to crank up the A/C! Star Wars Shop has some of the last of the scaled replica helmets from Master Replicas now available. Stop by and grab Commander Gree before it is gone! While you are there, don't forget to grab the Special Ops Clone Trooper Scaled Helmet too! 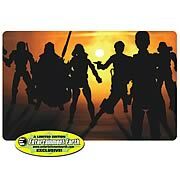 The team over at Jedidefender.com have uncovered another upcoming exclusive for SDCC. This time, it's the StarWarsShop exclusive Clone Trooper (Senate Security) figure. Head over and check out the full carded image. We've also added that figure to our SDCC exclusives list. Who the heck is Pax Bonkik? Just an obscure character from TPM, who also happens to be joining the 30th Anniversary Collection Visual Guide. Check out this Greedo look-a-like in the latest Enhanced Visual Guide! Don't feel like reading through the dozens of questions from this round of Hasbro Questions & Answers? NO PROBLEM! Gold 5 does it again in our forums with another Q&A Headlines Report. See all the questions with significant news rounded up into one quick and easy read! The Naboo Soldier joins the 30th Anniversary Collection Enhanced Visual Guides tonight. Click below for all the details! Great new Indiana Jones items have arrived, such as the Disney Exclusive Mickey Mouse as Indiana Jones figure and the Last Crusade 3 3/4" figure set. For Star Wars, we have the new wave of Expanded Universe exclusives available along with Gentle Giant Han Solo and Emperor Animated Maquettes. Next week we will be attending Wizard World Chicago, so stay tune for next week's newsletter to find out our booth number. We hope to see you there! In the meantime, check out our huge inventory of collectibles (it's too bad we can't fit it all in our trailer!) at www.brianstoys.com! Today's 30th Anniversary Collection update features Anakin Skywalker, as seen in ROTJ. Take a look at the latest Enhanced Visual Guide below! It's time for another Hasbro Q&A Round-up report. Our man Gold 5 has all the questions (and answers) from this weeks Hasbro session right here! Want to know what eFX is up to? The latest eFX newsletter is hitting mailboxes, with tons of information on everything from upcoming products to SDCC information. Check it all out below! It's time for another round of Questions and Answers from the Hasbro team. Read them all here! another big round of new preorders and some more new arrivals! Entertainment Earth now has the Kurt Adler Jawas pictured. Stop by to see this very cool Christmas goodie! Acme Archives has announced their SDCC exclusive: Yoda from the upcoming Animated Clone Wars! As I am sure you are aware with the release of Roron Corobb, we have officially wrapped up the original Clone Wars line (fyi keep a look out for a very very special announcement about this line in the next couple weeks). This YODA key marks the beginning of a new line of Character Keys for Acme, and I think you will agree that it should be another fun line to collect. Sideshow Collectibles has the latest Life-Size Droids Q&A listed in this weeks newsletter. Check it out for more information on these awesome full-scale electronic goodies! Saber-Stand.com wanted us to remind our viewers that the Hasbro Force FX Sabers are coming soon, and when they do you will need more stands than ever! Stop by Saber-Stand to check out their unique vertical solution for displaying many stands in a smaller space! All New Enhanced Visual Guides! It's been a while since we've brought you a Visual Guide update, but there is a reason for that! A new style Visual Guide has been in the works for some time now and I wanted to wait until it was complete before posting any more guides. So, today we bring you the all new Enhanced Visual Guides! This new style guide brings you the same single page view as before, but now with the ability to zoom and more! For a complete tour of the new format, stop by our Special Report: Anatomy of an Enhanced Visual Guide. In the mean time, check out our inaugural Enhanced Visual Guide from the 30th Anniversary Collection: Jango Fett. All guides moving forward will have this new, enhanced look, with built in navigation to other related guides and the ability to zoom in for details. The best guides on the internet just got better! Hello all! It's been a while since we've sent out newsfeeds to you, and we've made some exciting changes to the AllTroops.Network! We want to share this with you, and hope you enjoy these exciting new changes! We invite you all to visit the AllTroops.Network. Thanks! Tons of great exclusives are the highlight this week at Brian's Toys! 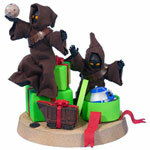 New Disney Star Tours figures, Star Wars Muppets, and Battle Rancor are now in stock! Also available are the new figures from the Transformers Animated TV show. We even have plenty more Sigma ceramics, including cool R2-D2 & R5-D4 salt and pepper shakers! For more of a great selection of vintage and modern toys, check out www.brianstoys.com! Hi - Here is a quick update from www.bigbadtoystore.com about a wide variety of new preorders, many new arrivals, and a new clearance sale! This Father's Day, don't give dad a boring necktie. Give him what he really wants – a Boba Fett lapel pin! We've got the latest Hasbro Q&A Roundup over in our forums. Stop by to see what answers everyone is getting around the net, including an image of the upcoming SDCC Disturbance in the Force set over at Yakface.com. This week we have the exclusive Force Unleashed Commemorative Collection figures in stock, featuring Darth Vader with Incinerator Troopers and Emperor Palpatine with Shadow Stormtroopers. Plenty of unique Star Wars vintage items have been added, including toy store displays and tons of Sigma ceramic products. Also in stock is the metallic-finished Deep Space Starscream. For more exciting collectibles, check out www.brianstoys.com! The latest Questions and Answers from the Hasbro team are here. Click through to check them out! Non-attendees get their chance at the SDCC exclusive Medicom Shadow Guard VCD today at 1PM EST. If you don't plan on going to the con, this is your chance to order. Non-attendee versions don't tend to last long, so make sure you get this today! Today is the day for SDCC atendees to pre-order the SDCC exclusive Medicom Shadow Guard VCD. Tune in to Sideshow's Web site at 1PM EST to place your order. You must be attending SDCC in order to pick this up! Non-attendee pre-orders will be June 6th. While perusing the aisle at Wal-mart today I ran across TAC comic pack #1 ( Kir Kanos & Kanor Jax). Either someone returned this to Wal-mart, or the online exclusive is now making its way to some brick-and-morter stores too. Hasbro has their first round of internet-wide Q&A's posted. Stop by to see all the questions from around the collecting community from the latest Q&A.